Oconee County consists of the unincorporated county areas and the four townships of Bishop, Bogart, North High Shoals, and Watkinsville. Most functions of the county government are covered on its website. 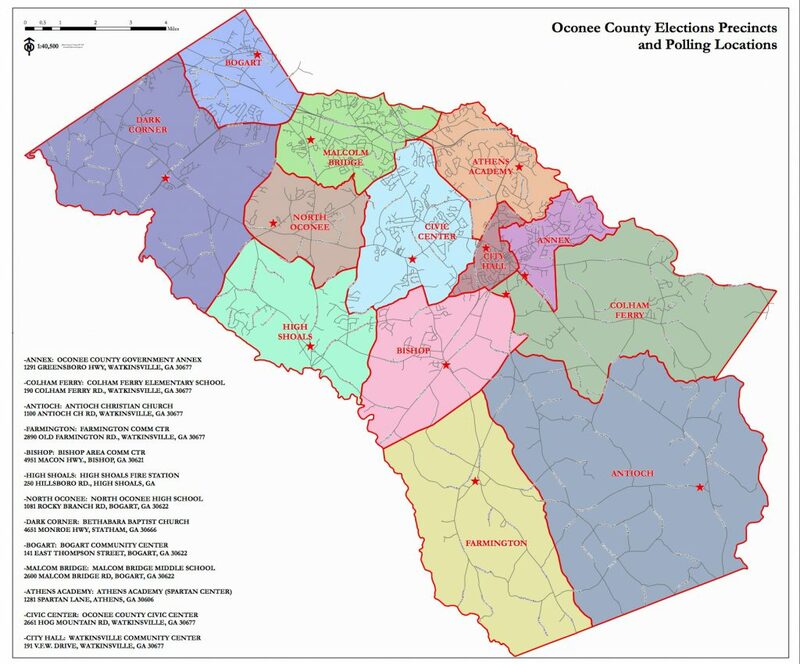 The county Board of Elections maintains a bunch of useful links, including rules about voter ID, absentee and early ballots, and the official precinct maps, etc. The county also has a My Voter Page, although theirs just refers voters to the state MVP page instead. Each of townships has its own elections board also, for local election issues. For the smaller towns, that’s just city hall, not a special board. 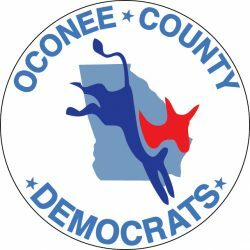 For the state legislature, in the State Senate, the entirety of Oconee County is District 46. That makes Sen. Bill Cowsert (R), (404) 463-1366, our state senator. In the State House, we’re split between District 117 and District 119. Most of Oconee is 119, but 117 has the northeast edge of Oconee County, plus a bit of Clarke and a bit of Barrow Counties. District 117 is represented by Rep Houston Gaines (R). The rest of Oconee is district 119, which has most of Oconee plus a little bit of Clarke and is represented by Marcus Weidower (R). The state executive branch is headed by Governor Brian Kemp, (404) 656-1776. However, this list of statewide offices may also be helpful for more specific enquiries. For the Legislative branch, in the U.S. House of Representatives, Oconee is in Georgia’s District 10. Currently, that’s represented by Rep. Jody Hice (R), (770) 207-1776 and (202) 225-4101. In the U.S. Senate, all of Georgia is represented by two senators. Currently, they are Sen. Johnny Isakson (R), (770) 661-0999 and (202) 224-3643, and Sen. David Perdue (R), (404) 865-0087 and (202) 224-3521.